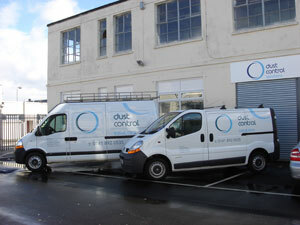 Dust Control Solutions Ltd design manufacture and install all types of dust control systems, fume extraction systems, odour control systems and pollution control systems for industry in Scotland, in particular Stirling. We also cover all areas of UK and Ireland. Dust extraction is our specialty. We can assist companies with woodwaste, such as wood burning plants, wood briquette machines and wood shredders. Cartridge filters for fine dusts, welding fume extraction, food industry including sugar and flour and other food products are all in our remit, with all of our filters incorporating reverse jet filter cleaning. We are also experts in dust suppression systems to reduce levels of airborne dust in timber shredding environments, coal mining facilities, quarries and waste disposal centres. Odour control can also be managed. Dust Control Solutions Ltd have experience in working with companies dealing with landfill and waste disposal, waste water treatment facilities and food processing, amongst others. Fume extraction systems handling dangerous explosive gases, for example extraction from spirit stores in a distillery is also a process Dust Control Solutions Ltd can manage, as well as paint fumes dry back extraction systems. All of our equipment complying with current regulations with regard to handling hazardous fumes. General ventilation systems including fume cupboards handling hazardous fumes need not be a problem. Ventilation systems providing cooling air, systems designed to provide spot cooling for personnel working in extreme temperatures or environmental hazardous areas can be implemented to reduce the problems. We provide full LEV testing of all types of extraction systems such as dust extraction, fume extraction and wood dust extraction. Dust Control Solutions is amongst the most prestigious ventilation companies in Scotland and the UK. Our services engineers are available on call 7 days per week 52 weeks in the year in Stirling and the surrounding area. On occasion we can supply temporary extraction should a serious breakdown occur.